The United States of America commonly known as the US, is one the most renowned and preferred immigration destinations across the globe. The nation is the ‘land of endless promises’ and is better known for its high standard of living and advanced technologies. And large numbers of people flocked to the US, the country has become an ethnically diverse and multi-cultural society Every individual, who aspire for better future aims to work in the US at least for a while. The country is dynamic from all perspectives, and at the same time it envisages a better turning period for your career. After serving for a significant period, individuals not only get recognition in the native place personally and professionally, but they also accelerate the timeliness of the growth that they would get in their professional life. The US is known as one of the most influential nation across the globe and thanks mainly to its robust growing economy, it is also one of the major global exporters as well as manufacturers. Alongside, the country is also a supreme leader in scientific research and technological innovations. How to Get H-1B Visa? The answer for this query is simple and at the same time interesting. 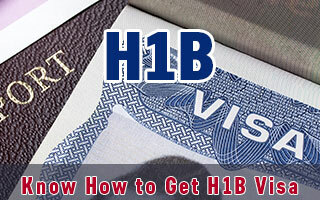 Basically, the H-1B visa is an expedient as well as legal method to migrate to US from India. The businesses in the US use the H-1B visa program to recruit foreign workers in highly specialized occupations. An individual can work for a maximum period of six years, on this visa. However, initially the petition will be issued for three years. An extension of stay is possible. The US H-1B program follows a lottery system; if USCIS receives more applications than the available cap i.e. 65,000 and an additional 20,000 number visa were set for individuals who have completed master’s degree from the US University. If you are also one among those who are aspiring to lead a better qualify life, then immediately migrate to US and work over there. If you are interested to apply for any of the above mentioned visas, fill out our Enquiry Form, so one of our visa expert will get back to you soon.